I like the idea of games that can promote learning. When kids have fun, they don't whine about school work that they accomplish. In my household, I have two very different children. One child thinks on his feet, is a quick learner and absorbs information quickly. My second child has to be coaxed into school work, struggles with reading and would prefer to play. With two different style, I like to find tools that are fun and are educational. That's where KaBAM comes into play. 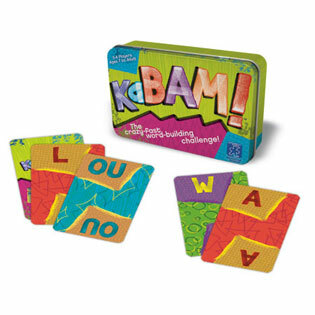 KaBAM is word building challenge game. Players can play as individuals or as teams. Each player draws two cards. Each card features word parts including suffixes, prefixes, single vowels, consonants and dipthongs. The first player to create a word using the two cards wins the round. We've been using KaBAM in a few different ways. Since my kids are still building their spelling skills, we modify the game to see how many words a player can create with the two cards. It helps my kids to think about letter sounds building into a word. This game has been a discussion point on the importance of pronunciation, word choice and spelling. On a recent road trip, we used the cards as a conversation spark. I would pull a card or two and the kids would have to think of a word with that specific letter. It could be a place we visited, a sight on the road, or a memory of the trip. What I really like about this game is that it can grow with your children. As their vocabulary improves, there are more words that they can create. From playing first word made to number of words known, there are multiple ways to play. For adult games, players can get more creativity. Some options could be think of an adjective with the specific letter or a place. This game can be adapted in numerous ways. KaBAM is available for purchase at Educational Insights. It retails for $12.99. It has been named the 2011 Parents Choice Award and a National Parenting Center Seal of Approval. Would you like to play KaBAM with your family? Here's your chance to win a game. Please use the Rafflecopter to enter. Disclosure: I received this game to review and to giveaway. All opinions are my own and were not influenced by any person or entity.